Join us again this summer as we conclude our efforts to “reconstruct the past” at Big Hole Lookout! Big Hole Lookout was built in 1930 for what was originally called the Cabinet National Forest. It is a ‘Grange Hall’-type lookout: a structure built atop a short talus foundation. This type of lookout predates the standard design seen in most other areas, and due to the difficulty in its construction, is quite rare. In fact, Big Hole Lookout is one of only two lookouts of its kind on the Lolo that remain intact! 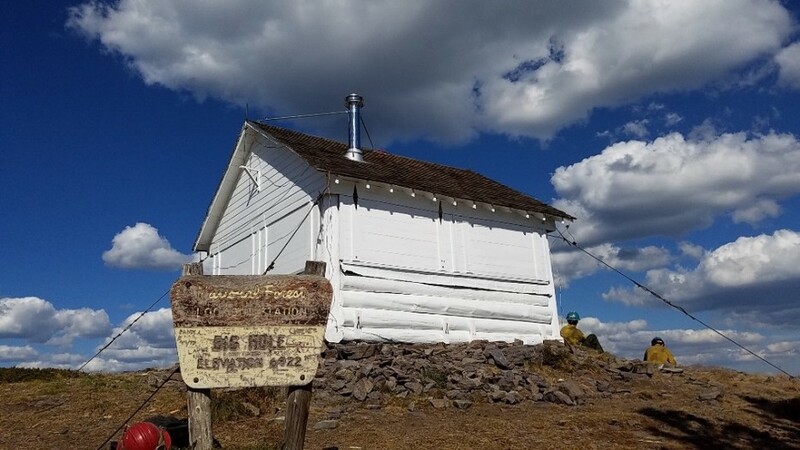 It saw its last use as a fire lookout in 1972, and although afterward abandoned, was determined eligible for placement on the National Register of Historic places (NRHP) in 1984. Although the site has long been deserted, there is a strong desire on the part of the local public to preserve this old structure and to make it available for recreational use. District staff members have received numerous comments, suggestions, and even offers from local residents to help repair the structure. We had planned to finish in 2016, but we were evacuated due to a large wildfire just five miles to the west. But, this year, with your help, we will take the final steps toward making the public’s (and our) wishes come true! Over the past four years, we have cleaned up packrat droppings and other potential hazards, stabilized the rock foundation, replaced severely rotted logs on the cabin’s west side, re-roofed the structure with new cedar shingles, replaced the chimney jack, stovepipe and stove, and reinforced lightning protection structures. In the winter of 2013, in preparation for Phase II, we fixed the windows to get them ready for installation. Since then, PIT volunteers and FS staff have completed or have begun a number of other tasks, such as replacing rotted logs, installing the windows, removing old paint, repairing the door and damaged hardware, and so on. This year, the FS will have to begin by cleaning out the structure and removing any potential Hantavirus threat again before we can start. After that, participants will level, square, and straighten the building, complete the work on the floors and ceiling, install the newly repaired flooring and door, reconstruct and install replica furniture, put the final touches of paint on the exterior and, at last, prepare the Lookout to roll into the FS Cabin Rental Program! As always, it promises to be sweaty and dirty work, but in the end, we’ll have had a lot of fun, and you’ll be able to say that you helped breathe life back into one of the Lolo National Forest’s most valuable gems. Make sure to bring your appetites and your favorite pair of hiking shoes (sturdy and broken in) – we hope you’ll join us for the final stretch in June! Facilities: Dispersed tent camping on-site near Lookout (3 miles from trailhead) at no charge; pit toilet at facility, water provided by FS; the District packing crews and the local Back Country Horsemen will assist in packing project and volunteer supplies and equipment in and out; all meals provided by FS; volunteers responsible for personal camping equipment, own work gloves, safety glasses/goggles, water bottle, and transportation to and from initial, designated meeting area – and you are welcome (though not required) to bring your own, favorite tools! Please note: though there will be a 2-day break during the project, this will be considered a single session. Pack teams will not be available during the break, so selected volunteers must commit to the entire period. Uninterrupted, on-site camping will be available for all dates between June 20–29.